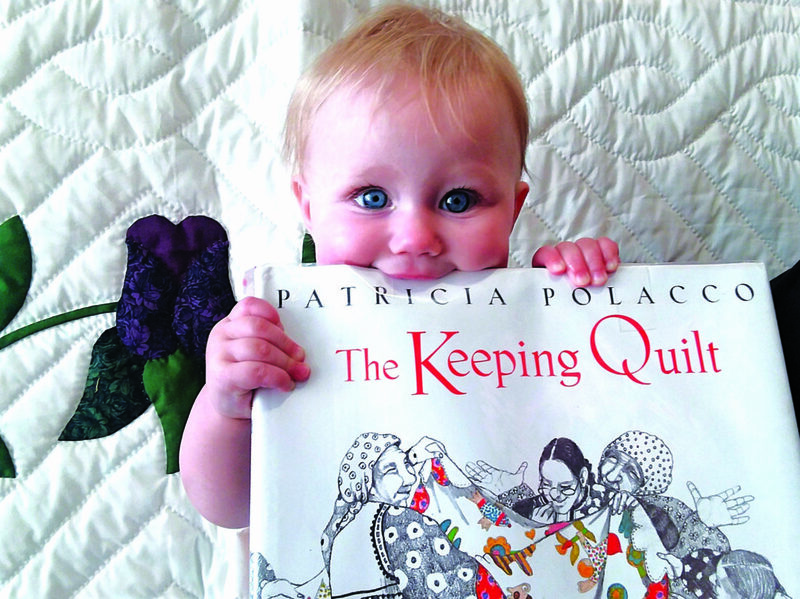 Courtesy photo Becca E. Keller, age 9 months, holds a storybook in front of one of two handmade quilts to be raffled at the Hollidaysburg Area Public Library. Becca is the daughter of Adam Keller and Anna Fedesco of Hollidaysburg. HOLLIDAYSBURG — The Hollidaysburg Area Public Library has announced its August events. 8 p.m. Monday through Thurs-day, 9:30 a.m. to 5 p.m. Friday and Saturday and 1 to 5 p.m. Sunday. n Ancestry: Library Edition is available for public use for free on the library’s public computers. n “1,000 Books Before Kinder-garten” is designed to encourage parents to read 1,000 books to their newborn, infant or toddler before they start kindergarten. Book logs/electronic apps are available to help parents keep track. This self-paced program is free and is guided by the 1,000 Books Foundation. n Artwork courtesy of 321 Art Gallery of Hollidaysburg will be displayed in the Community Room and Children’s Room throughout the month of August. Rotating works on display may include photography, watercolor, mixed media, oil paintings and more, and displayed items are available for sale to the public. For more information, call 317-5045.
n Acrylic works by Abraham Onkst will be on display in the Children’s and Young Adult rooms throughout the month of August. n The Handwork and Arts Group (adult crafting club) meets each Tuesday from 1:30 to 3:30 p.m. Take your own materials and projects; call Janice at 695-2281 for more information. n The Knit Wits Knitting and Crocheting Club meets from 6 to 7:30 p.m. on the first Thursday of each month. Take your own materials/projects; beginning knitters are asked to take light-colored yarn and size 8 needles. No signup is needed, visit the club’s Facebook page for more information. n The Allegheny Essential Oils Club holds classes from 6 to 7 p.m. each Wednesday. Topics vary; all are welcome; visit the club’s Facebook page for more information. n The Canasta Club will meet from 11:30 a.m. to 1 p.m. each Thursday in August. Beginners are welcome; call 693-9292 to sign up. This program is intended for adults. n The “Friday ROCKS” intergenerational drop-in program will meet from 2:30 to 4:30 p.m. Aug. 3, 10, 24 and 31. All ages are invited to paint rocks to place in public places for finders to keep or re-hide. Post pictures of completed rocks to Facebook: Central PA Rocks. n “Texas Hold’em 101” meets from 6 to 8 p.m. Aug. 6, 13, 20 and 27. Beginners are welcome; intended for adults, no signup needed. n Free Tech Help will be provided from 10 a.m. to noon Aug. 4, 11, 18 and 25 to help with technical questions on laptops, tablets, cell phones and other devices. No signup needed; first come, first served, always call ahead for availability. n “Meet Newton, A Diabetes Alert Dog!” at 1 p.m. Aug. 2. Newton helps 12-year-old Bella with her type 1 diabetes. Courtney and Bella Getty will explain how Newton became a part of their family and how important he is to everyone. For all ages; no signup needed; children must be accompanied by an adult. Visit “Getty Sugar Paw Blessings” on Facebook for more information. n “Hands-On Computer Anatomy” will be held at 6 p.m. Aug. 2 for grades one through four and at 1 p.m. Aug. 7 for grades five through eight. Students are invited to break down and identify the parts of a computer under the guidance of Miss Melany of Tapia Technology. Space is limited; sign up or ask questions by emailing melany@tapiatechnology.com. n “Stuff The Bus” School supply campaign through the Family Resource Center of United Way of Blair County is in its 10th year. Donations of school supplies (pencils, backpacks, paper, crayons, folders, binders, glue, scissors, etc.) benefiting students throughout Blair County will be accepted in the library’s Children’s Room through Aug. 2. Aug. 3. Children from newborn through high school and their families are invited to enjoy activities and special guests throughout the summer. Newborns through students who have completed sixth grade who keep track of their reading using book logs get small participation prizes each week. n In conjunction with the Libraries ROCK! Summer Learning program, children’s toys, school supplies and other materials will be collected for all to share. Take items in good condition to share with your neighbors. No clothing or items in poor condition will be accepted. Give what you have; take what you want/need. Small money donations for the exchange are appreciated. A final yard sale with refreshments available for a donation will be held on the patio on Aug. 10.
n “Ukuleles ROCK” will be held at 1 p.m. Aug. 3. Learn three of the most useful ukulele chords and songs that use them. For ages 12 and older; take your own ukulele or borrow one ahead of time with your library card and take it to the class. Email melanie@halibrary.org to sign up; space is limited. n “Storybook Ball” will be held from 1 to 4 p.m. Aug. 4. Children ages 4 to 12 are invited to dress as their favorite storybook character and enjoy a special visit from Belle of “Beauty and the Beast,” along with crafts, snacks and prizes. No signup needed; children must be accompanied by an adult; this free program is provided through Beauty, Brains and Heart of Altoona. n “Focus on Art!” will be held at 10 a.m. Aug. 6 and 13. Paula Miller sponsors this free session of easy crafts for parents and young children to enjoy together. RSVP to 605-0646.
n Free computer classes will be held at 1 and 6 p.m. Aug. 8. Tom Robison will answer questions at the class or participants can email questions ahead of time to corporal99@msn.com. No signup needed; all are welcome. n “Creative Writing ROCKS!” will be held Aug. 9 with Roxana Cazan, assistant professor of the English, literature and languages Department of Saint Francis University, Loretto. Free, fun, interesting creative writing activities for grades three through adult. The 1 p.m. time slot is geared for grades three to five; 3 p.m. is for grades six to nine and 6:30 p.m. is for high school through adult. No signup needed. n The Canal Basin Festival will be held from 11 a.m. to 3 p.m. Aug. 11 at Canal Basin Park, Hollidaysburg. Visit the library’s table and enjoy a small children’s craft. n A Bob Evans fundraiser will be held Aug. 13 to 17 during regular restaurant hours. Hand in a flyer (available at the library) at checkout, and 15 percent of the proceeds will benefit the library. n “Music With Marabeth” will be held at 6 p.m. Aug. 15. Children and their grownups are invited to come sing, dance, wiggle and giggle with Miss Mara-beth including fun with egg shakers, rhythm sticks, hula hoops and more. No signup needed; children must be accompanied by an adult. n “Teeth ROCK,” sponsored by Betar Dental and Associates, will be held at 10:30 a.m. Aug. 16. Enjoy a preschool story time with Miss Kaylie and learn why teeth are awesome. Children must be accompanied by an adult. n The ABC Photo Society will meet at 7:15 p.m. Aug. 20. Visit abcps.club for meeting topics; all are welcome. n A free showing of the movie “I Can Only Imagine” (PG, 2018, 1 hour, 50 minutes) will be held at 6 p.m. Aug. 24. No signup needed; snacks will be provided. n A Ukulele Jam will be held at 2 p.m. Aug. 26. The Allegheny Ukulele Kollective invites all interested people to attend; there will be ukuleles available to use. Email alleghenyukes@gmail.com for more information. n La Leche League of Altoona will meet at 6:30 p.m. Aug. 28. Interested breastfeeding mothers and their children are invited to attend, meet the members and find helpful resources for families. For more information, email alisonk2299@gmail.com. n Keep Blair County Beautiful will meet at 6 p.m. Aug. 29. All are welcome; the meeting’s mission is to inspire, educate and inform people toward a clean, green and beautiful Blair County. Call 942-7472 for more information. n The Summer Classics Book Club: “The Young and the Restless” will meet at 2 p.m. Aug. 30 to discuss “A Tree Grows in Brooklyn” by Betty Smith. Copies of the book are available at the library; this book club is geared for adults. n Two handmade quilts on display at the library were donated by John Young. Quilt raffle proceeds benefit the library and its services. Tickets are $5 each or three for $10. The drawing will be held Oct. 20.
n The public is encouraged to support the library’s summer fundraising: Gardner’s chocolates, Sheetz coupon booklets and the Friends of the Library’s Best of Friends Bookstore.